The restaurant was founded by group of young people aiming first of all to acquaint people of Ashdod and local cities with culture, diversity and wonderful world of beers, ciders, ales, stouts, lambics, porters, lagers and other kinds of low alcoholic beverages and also to season drinking of these noble heady beverages with exquisite dishes of European cuisine, well-known for its wonderful compatibility with beer. Since In different counties there are various typical beer snacks and dishes of all kinds, in our restaurant you will find rich choice of dishes. Here you can find German sausages with stewed cabbage, as it served in Bavaria, and New Zealand and Canadian mussels – the fancy of Polynesian beer-lovers, several kinds of shrimps with different sauces, like in Spain, and famous Prague veprevo koleno, and hot smoked Dutch trout from own smokehouse, and just typical British buttered snacks and more other poultry, meat, fish and seafood dishes professionally cooked by our skilful chefs. Of cause, we just must to focus your attention on our storage and drink-serving method. Especially for these reasons, we designed and realized a huge freezing chamber, where beer casks are kept at temperature of 2 degrees centigrade and from which through cooled pipe and 40 taps beer goes to cold beer mugs. After such engineering triumph without delay our waiters bring beer directly to your table. Thus, we do our best to keep freshness and all gustatory shades brewer wanted you to taste. 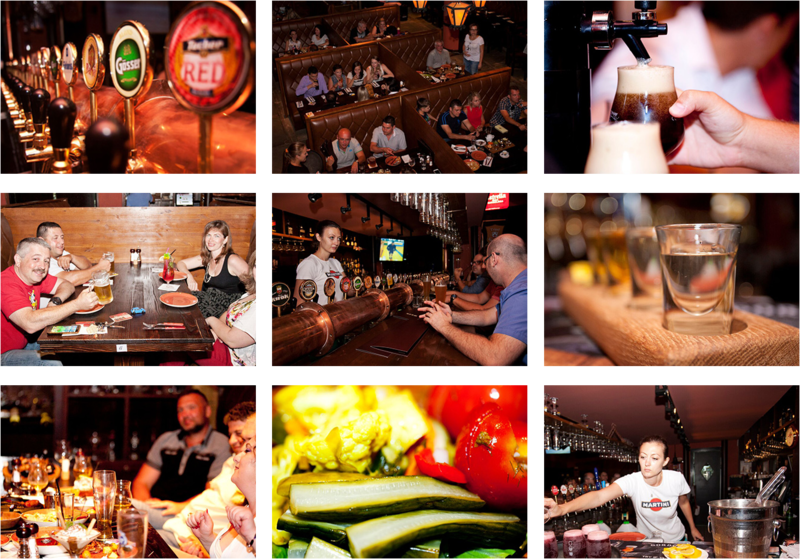 Concerning the name of “Pint” restobar, it is not as simple as it seems. . It is notorious that, that in USA or England and some other countries, the imperial system is used and for example in Irish pub, you will be misunderstood after ordering “half litre”. It is not widely known that one of three ships of famous Columbus expedition was called “Pint” and sailor on duty from the “Pint” was the first to see the New World. Therefore, the name and the restaurant emblem in the form of sailing vessel steering wheel are connected with this word. Finally, we must not forget, that the restaurant is situated in the biggest seaport of Israel – in Ashdod, the city, where everybody life anyhow is connected to the sea or the port. So we wish resto-bar "Pinta" prosperity and a fair wind in the diverse sea of beer, which definitely should be discover by the guests of this wonderful place, as well as the coast of America was discovered by “Pinta” sailors.